Welcome to the Holiday Marketeer blog series in which Boost Media serves up hearty portions of 2015 holiday digital marketing strategy. In this installment, we talk about optimizing for Green Monday. Green Monday falls on December 14th this year, and in case you weren’t aware, it has emerged as a notable shopping holiday. 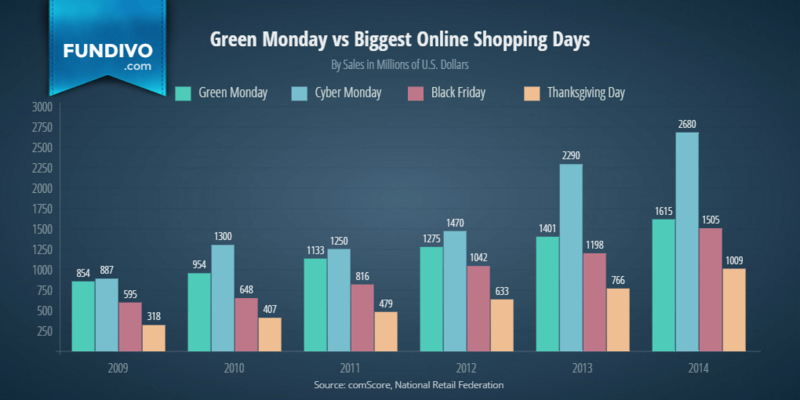 Green Monday plays off the success of Cyber Monday, and is now among the top revenue-generating days of the holiday shopping season. $1.6 billion. The amount of revenue generated on Green Monday in 2014. 70%. The percentage of retailers who planned Green Monday promotions in 2014. 15%. The year-over-year growth of Green Monday revenue from 2013 to 2014. If 70% of the competition is offering Green Monday deals and your brand is not, you’re missing out. Why would someone buy from you when they can buy the same thing from a competitor at a discount? Test out Green Monday messaging and promotions in ads and on landing pages. If you aren’t yet confident in the returns on your efforts, a quick and dirty way to test is to simply replace “Cyber Monday” with “Green Monday” in your ad copy and relaunch. A quick hack for landing pages is to add a Green Monday banner to the top of the page. In the spirit of stretching holiday shopping days to last entire weeks or months, brands such as Walmart have already released some Green Monday promotions early. Take a look at your competitors’ sites and perform searches on their brand names, including the search term “green monday” to get a sense of what to expect. Green Monday is one of the top revenue-driving days of the year, but consumer awareness is relatively low compared with Cyber Monday. Search volume indicates consumers are significantly less likely to actively seek out Green Monday deals. To optimize Green Monday revenue, test a positive association between Cyber Monday and Green Monday by comparing Green Monday to Cyber Monday in your ads. This may resonate with consumers who feel they’ve missed out on Cyber Monday deals, or those who enjoyed Cyber Monday deals so much they’ll be happy to shop more on Green Monday. The holiday shopping season is filled with big shopping days. As these events continue contributing to revenue growth, marketers are likely to invent new ones. It’s vital to remain agile and develop efficient, effective approaches to optimizing for key holiday shopping events that emerge like Green Monday.